Always Test Small Area Before Applying Rusterizer. It Is A Powerful Formulation. 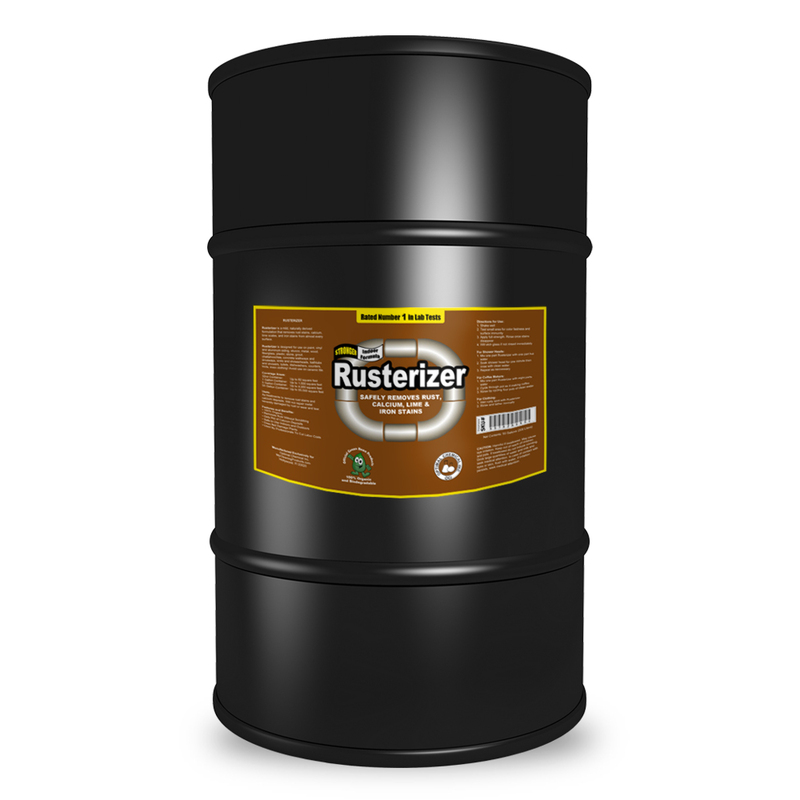 Rusterizer is being used in sports stadiums, ship yards, resorts, theme parks, irrigation systems, malls, construction sites, city maintenance, and is a top product among contractors and cleaning professionals due to it’s unique formulation. This unique rust remover is guaranteed to cut down labor costs of any-size rust removal project. I am simply amazed of how it literally melted the rust stains before my very eyes. I have a ten year old car that is well maintained both inside and out but the New England seasons sometimes takes its toll , the snow and salt still managed to sneak up on my under chassis. 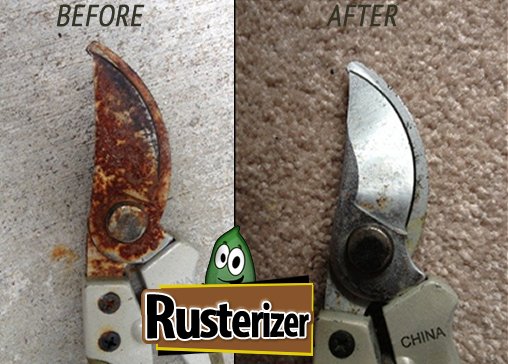 I tried a lot of different rust remover but nothing worked like Rusterizer. My review is independent and I am just a happy customer and want to share the experience to people out there like me. Two thumbs up for this best helper ever!! Received today and could not wait to try it. I had a large rust spot running down the side of my stucco home. I knew what caused it an air conditioner that needed to be flushed out. It’d several people look at it and ride all kinds of of methods toget rid of it . In fact I tried bleach and water nod hd someon ty pressure wash it. It was still there until today. It is now gone gone . I sprayed Rusterizer on it and couldn’t believe my eyes it just disappeared. I then hosed the area. Thank you for a great product. I have rust stains on my white lamp posts and pavers due to the sprinkler system feeding directly from my well. I have purhcased various products and spent endless hours scrubbing and cleaning to remove the rust but nothing seemed to work. Few days ago I received an email from Amazon regarding this product and was quite hesitant at first but of course had nothing to lose so I decided to just buy this product as well and give it a try. I happened to be outside when the UPS truck arrived. I opened the box, attached the spray nozzle and walked over to my now yellow/rust stained lamp posts and gave it 2 pumps. Thinking nothing would happen I was shcoked and amazed. The stains disappeared in millisenconds. I am one happy customer and buying every ounce available. Finally a product that works the way they say it does!! I had this heavy rust stains on my concrete try everything nothing would work, sprayed the rusterizer on the stain within a minute the stain disappeared back to the concrete color. Would definitely recommend this product!! I was skeptical when I saw this product. But when I saw there are many good reviews, I thought I give it a try. I bought this because I had rust on my car’s drums. As soon as I sprayed it on, it then started to make sizzling sounds and there I saw it doing the magic. IT ACTUALLY WORKS!! Now my car is rust free. Some of the deeply rusted parts might need extra sprays and patience, so apply more as needed. I highly recommend this product. I tried many home remedies for removing hard water deposits on my stucco without any luck. This product worked great. No scrubbing required. Just keep spraying the area starting at the top and working down until the deposits start to wash away. This rust remover works fantastic, (if I can borrow that word). You just spray it on and the rust stains disappear from view. I will be buying more Green Bean Rusterizer right after this review, (I have more stained concrete to clean). I have tried several products, as well as had a professional concrete cleaning company come to demostrate what they can do, but this does it for me. It makes my concrete and waste containment area sparkle. This product works great!!! I was trying to remove rust off of my brick and mortar. Rust had developed from wreathes that we had installed over the christmas holiday. This rust had been stained for well over two years. I tried numerous products to remove the rust to no avail. Initially, I tried presoaking the area to be treated. I found the product to work ok; however, I began to use the product dry and had significantly better results. You can literally hear the product sizzle as it’s dissolving the rust. I don’t believe you will find a better product for the intended purpose. Also, the product does not appear to be hazardous. There were no toxic fumes or burns of the skin. HIGHLY RECOMMENDED!!! When we came home last fall from our vacation we were horrified by the stains on our flagstone patio. The planters had overflowed from the rain and we had huge rust stains all over. We tried multiple products from Home Depot that smelled like bleach. Nothing worked. Based on the reviews of this product we decided to try it. I sprayed it on the stains and within minutes rinsed the stains away with water. I couldn’t believe it. Fabulous product!! As I’ve learned, heavy rust stains on stucco are impossible to clean. But, Rustolizer makes them less impossible. 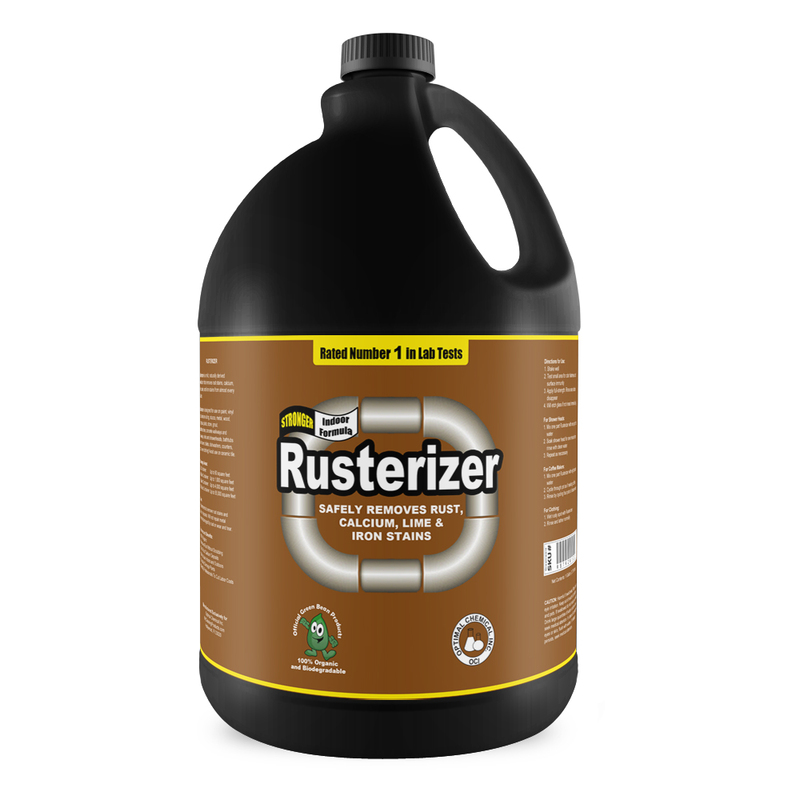 Of the products I’ve tried, Rustolizer is a clear No, 1, Goof-Off Outdoor Rust Remover comes in at No. 2 1/2, and CLR comes in one notch above water. 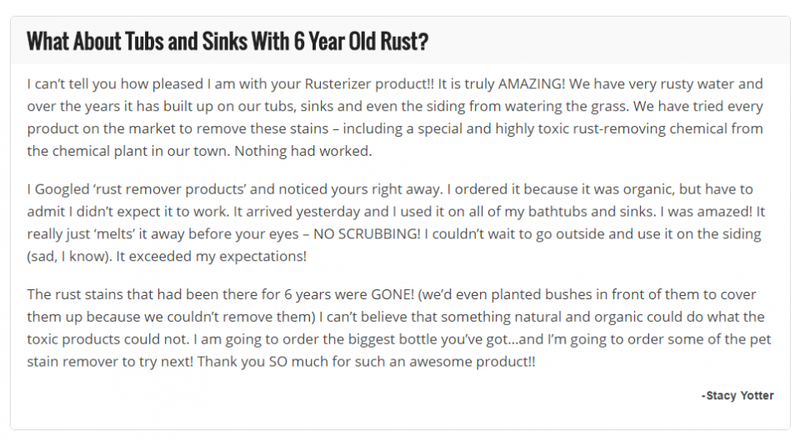 The most amazing rust cleaner for toilets and tubs!!! Look like brand new and can’t ever live without this!!!! Just AMAZING!!!!! 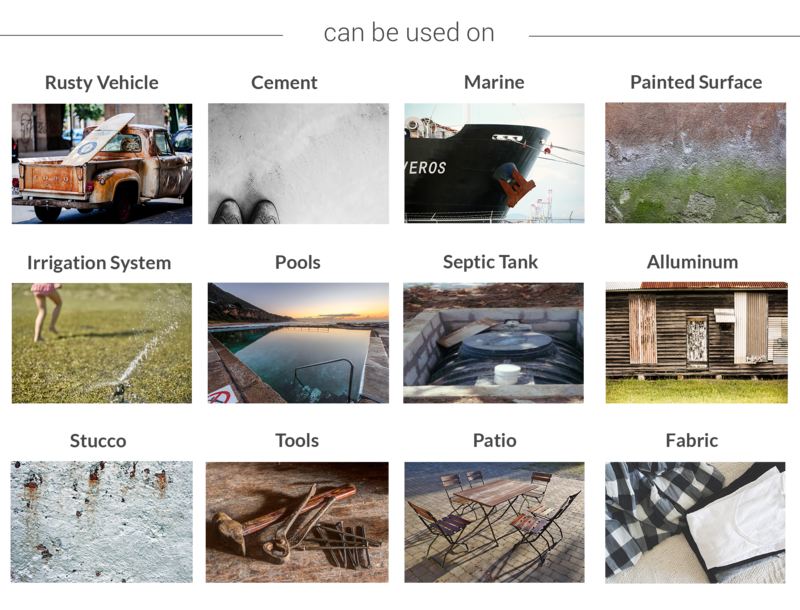 Where Surfaces Can I Use Rusterizer On? 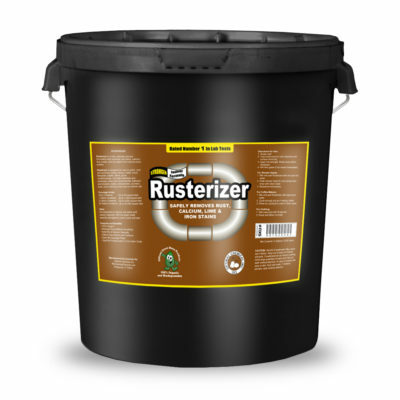 Rusterizer is effective on concrete walkways and driveways, irrigation system, spinkler systems, pools, septic tanks, non acrylic tubs/sinks, shower heads, bathtubs and showers, toilets, dishwashers and counters. Additional materials that are compatible with our formula is vinyl and aluminum siding, stucco, metal, wood, plastic and stone. 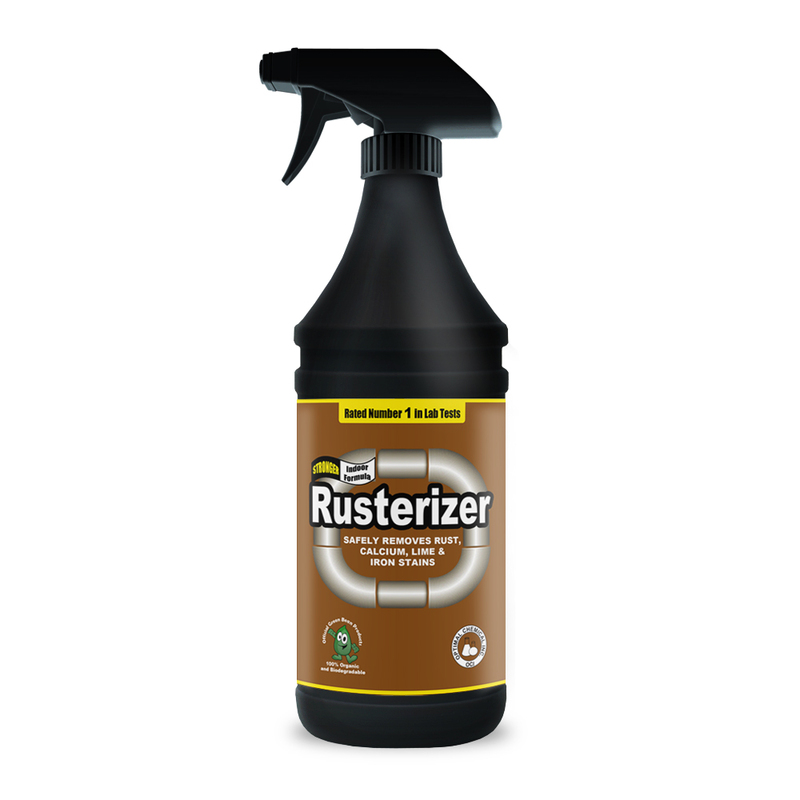 Lastly, Rusterizer is also effective even on painted surfaces, stone, grout, chattahoochee and fabric-made items. Rusterizer Is Not Recommend To Use On: Acrylic tubs / sinks, glass, fiber glass, ceramic tiles, stainless steel, galvanized metal, natural stones, marbles, ceramic tiles. 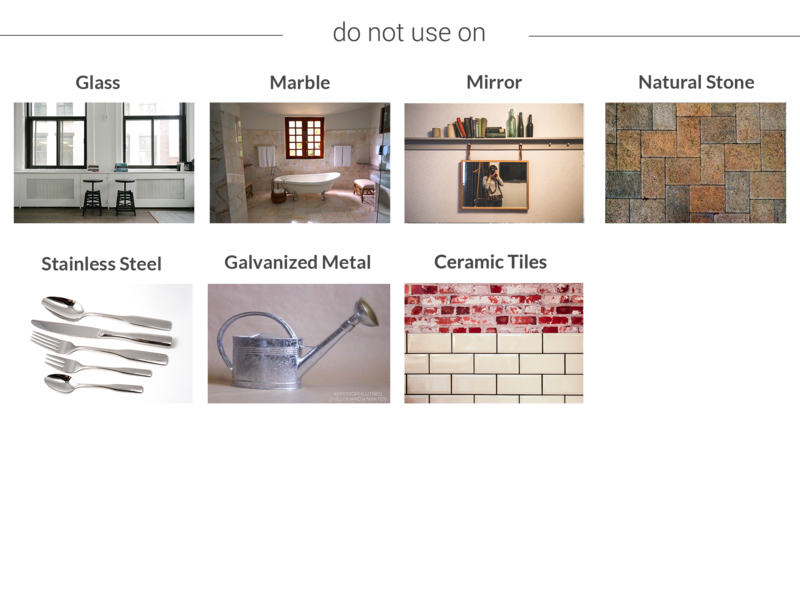 Marble and Porcelain Tile are recommended to be avoided when using Rasterizer as well. As always, to be safe we recommend testing in a small area to avoid any discoloration before using the product entirely. How Much Rusterizer Will I Need? Will Rusterizer Harm Plants, Grass or Vegetation? The formulation will not harm plants, grass, or vegitation on contact. Although, it is highly recommended to do a wash-down to remove any residual product left from the work area. 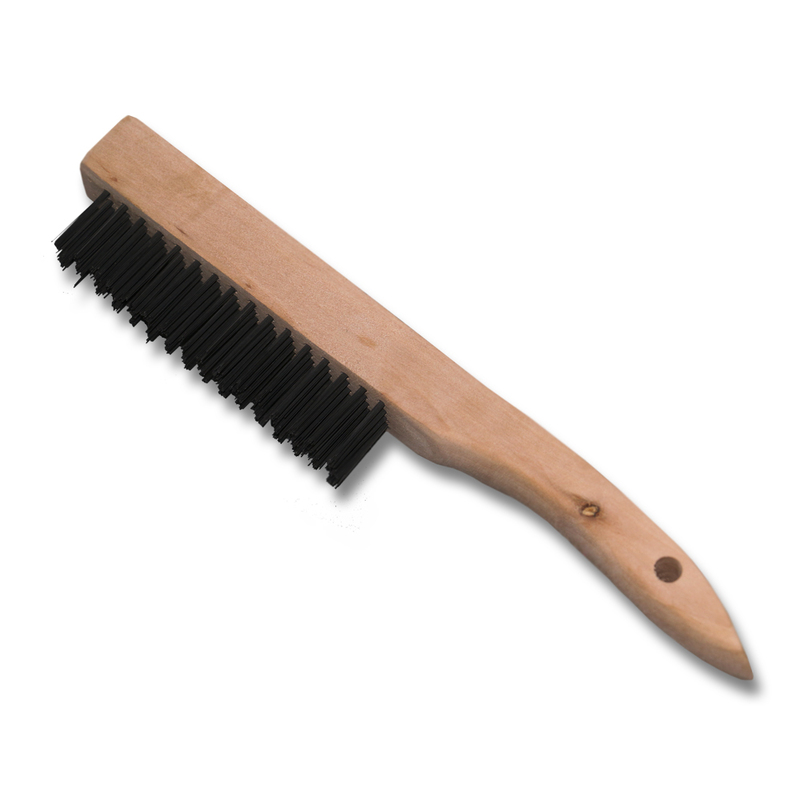 The product is formulated for quick rust removal while cutting labor costs in half. Below is our universal rules for applying Rusterizer on our recommended surfaces. Apply/Spray area that requires treatment. It’s that simple, literally spray or apply to area and watch Rusterizer neutralize rust, calcium or lime before your eyes.